I think we can all agree that video has become the most popular avenue of advertising on social media. What we have discovered though is that some business owners are not sure of what to do on social media once they have their video. If that is you, here are some tips that can help you with your next social media video campaign. URL links to your marketing video (whether it be from Youtube or Vimeo) will NOT automatically play on social media feeds. This is a major problem because that means your followers will have to work in order to see your video. For example, if you were to use a Youtube link in a social media campaign, your followers would have to click on a picture preview of your video (which sometimes, these picture previews don’t even look like videos… MAJOR issue there), which would then redirect them to Youtube or Vimeo. They would then have to click again to start the video OR even worse, have to sit through a commercial before watching your video. At that point, this problem would indefinitely cripple a video marketing campaign and even disengage your follower’s interest….especially if they had to watch a commercial. Uploaded videos, however, WILL automatically play on social media feeds. Meaning when your follower scrolls through their social media feed, your video will automatically be playing right in front of them. This is huge because you’re ensuring that your video will be seen.. even if it is for a couple of seconds. With all of that being said…we want to make sure that your money is well spent and your video is being placed in front of your followers. So make sure that you are downloading your video and uploading it to Facebook, Instagram, LinkedIn, etc… It might be an extra step for you, but it will give your audience an effortless way to watch your video and hopefully compel them into action. Facebook & Instagram (who are under the same ownership) realized that they could make a profit on businesses using their platform. So back in 2018, they rolled out this algorithm that would allow only “Meaningful Interaction” posts to be prioritized over others. 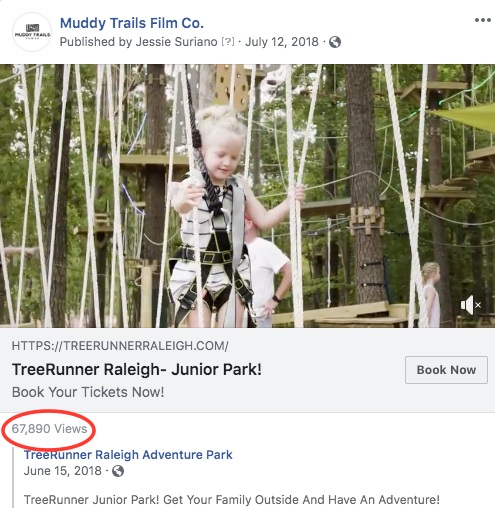 By putting this in place, business pages would need to “Boost” their posts in order for their entire audience to see their post. To recall what it was like before the Algorithm was introduced, everyone who liked your page would see your posts. Under this new Algorithm, only people that consistently like your posts will be able to see it. It doesn’t make a lot of sense, but all you need to know is this: In order for your entire audience to see what you are posting, you have to pay for it. How do I work around this Algorithm? Facebook & Instagram want to see interaction on your business page & posts. For example, if your page rarely sees interaction… it is automatically going to be given a low “Meaningful Interaction” score (YUP, Facebook & Instagram are rating your page & posts) and your posts will be rarely filtered through your followers feed. Confession… we do not follow this method every time. We set these as goals, but of course, no one is perfect. What I can tell you is that it works. So if you do not want to spend a dime on advertising, make sure you are posting often and you’re engaging your followers. Okay I know, I just said that Facebook & Instagram are after our wallets…but they really have something to offer that we should all consider. In writing this blog post, I was reminded that “Boosting” your post (whether it be Facebook, Instagram or LinkedIn) can give you access to an entirely NEW audience that you would not have been able to obtain on your own. Below, I have provided 4 examples of paid advertisements that our clients have done in the past. Make sure you take note of the view count. You will see that each of these campaigns was viewed thousands of times. These video marketing campaigns were highly successful and their success wasn’t free, they had to pay for it. But, great news… it’s CHEAP! I know from personal experience that for $15- $20, it will guarantee me over 5,000 views on Facebook and if we were to do a campaign with a budget of $100, that would guarantee me over 15,000 views. Think about it….isn’t that amazing?! So, if there was any advice that I could give, Place $100 - $200 from your marketing budget into marketing on social media. Whether it be on Facebook, Instagram or LinkedIn. If you want NEW clients & NEW business to walk through your doors, give paid advertising a try and see the results for yourself. For more information, here is a post created by Facebook Business on Video Ads. We want your videos to succeed on social media! So remember that the goal is to engage your followers, make it easy for them to see your videos and budget time & money to promote your post. I promise that over time, you will see results.